Subwoofer Module amplifier Circuit is indeed very popular with the audio hobbyist. The circuit that I publish, is a circuit of modules that use the subwoofer amplifier ic op-amp 4558 which acts as a reinforcement of bass tones (subwoofer) assisted of it's by the workings of some supporting components such as resistors, capacitors. 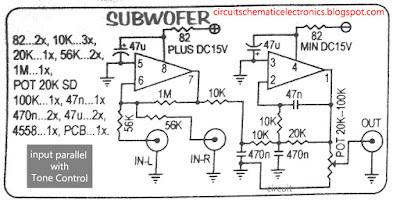 The workings of this circuit adds to the gain on the frequency of low tone (LPF), so that the sound output is generated for the subwoofer speaker to be more steady and loud bang, but with the voice that minimal noise, in addition to the performance of the power supply should also be stable, so that it will sound hum was gone. 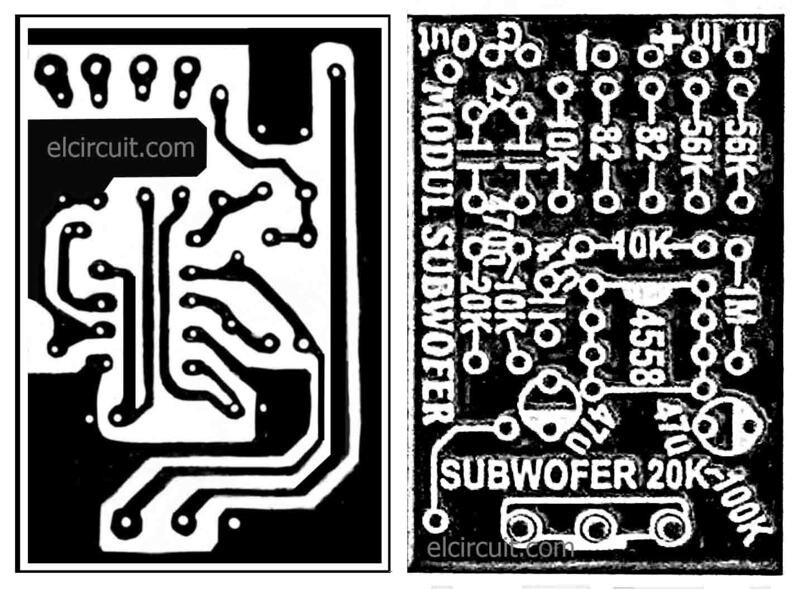 Below circuit diagram, PCB design, and How to assemble audio signal subwoofer module amplifier. This circuit requires little components, are also easily accessible. for the power supply voltage, symmetric voltage 15VDC required for maximum results. And PCB layout below will help you more easily to assemble. Next, for the installation, only parallel input audio subwoofer output with tone control circuit, so that if the Volume on the tone control circuit in any state 0, Subwoofer can still set the volume. because the output of the subwoofer module with an output paralel tone control. 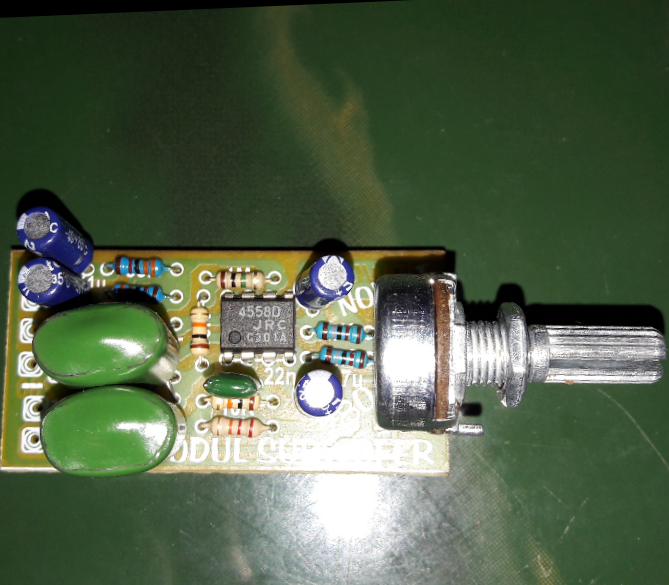 Enough circuit Subwoofer Module Amplifier. if anyone ask please comment below. 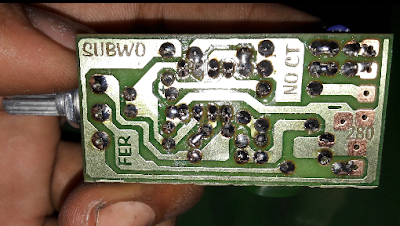 This 12VDC Subwoofer Filter/ Subwoofer Module/ Low pass filter. 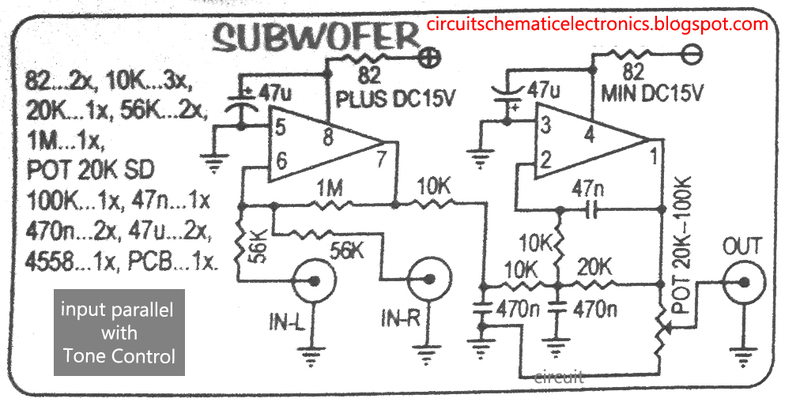 Using +12V DC power supply and ground, But both Subwoofer circuit using main op-amp 4558 tl74. please change * with . Hi Sir' i Cant UnderStand The list of Components plz Write Them in Detail. please can you provide the component you not understand? sorry for the layout, i will update with clear image. 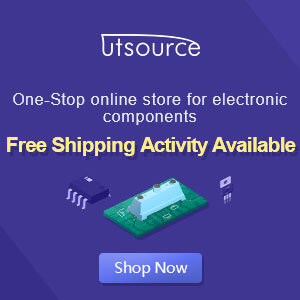 what the power supply you using for subwoofer module? Hi , WAHYU Eko Romadhon, I have a subwoofer model sav - 1007 SUPERSONIC it's a 200 w output of music 4 ohms power supply 24,15,volts. After playing some hard music it suddenly went down and distorted music which you can hardly hear is coming out even with the volume high.Please help what could be the problem and what should I check? It has 3 x 4558d, 1 x lm 358p, a cd 2399 or k246 and fm 62429.
what the power amplifier using? and please check the power supply voltage, what the voltage is many drop or not ? if yes you must change the electrolityc capacitor on power supply. You can use the printer ink, but u must use a transfering pcb by using a lotion and a iron or heater. mas Wahyu, itu kalo liat diagramnya, yg dipake outputnya kok cuman chanel R saja, sedangkan yg chanel L dari tone control langsung masuk Power ampli? 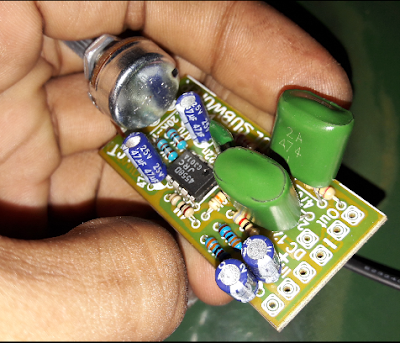 PreAmp Subwoofer control ini dikhususkan utk power amplifier yang digunakan untuk mengendalikan speaker subwoofer (low freq), jadi utk keluaran hanya mono dari dua input L /R. I want diy kit for subwoofer 4558.
i not sell the kit, but you can made it yourself. I have a problem in JBL125 power amplifier and pre-amplifiers. There are 2 problems. Please check ground input, what its connected to input? and check the potetiometer if there it have. Or you can check the amplifier before connecting to the preamplifier is there any have sound output? Thank you for your advice. I checked the the main amp connected to the sub woofer. That side work properly when I give the input through a DVD. Problem is the pre amp as I mentioned earlier. 4858D connected to speakers front and rear. 4558D pin number 321 other pins connected to 657 input line. Model JBL-125 pre amp SCS125A PRE-SCH. Okay sir, it would be difficult. Can You Give me The Size OF this 4558 "that black and white print"
Thank you for a great blog that I got the knowledge from your blog. The circuit is easy to understand. thanks for visit, i hope you enjoy in here. Warning!! SPAM has been detected! This is one of the best subwoofer module I found here and i'm proud of it's quality results. Thank you sir for solving one of my querries. Is it connectable with any power amplifier? I drive jbl gto1202d dvc 12"
By 8 transistor (1943/5200) through a passive crossover.